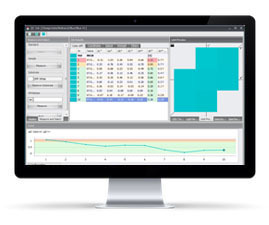 Colibri® ColorQuality enables manufacturers and suppliers to manage and control production. Colibri® ColorQuality communicates seamlessly with ColorMatch and ColorTint enabling you to modify your recipe during the production process. This novel tool allows you to view your color catalogues and standard collections in the CIELAB L a b or L C h color space. You can even add multiple color sets and view overlapping color gamuts. ColorMosaic displays true color hulls and color points and enables you to follow the color travel of your effect pigments. Make the right decision first time round – by viewing your final production samples in their true color space before approving new standards.